I’ve always loved Thai Green Papaya Salad (Som Tam), but I’ve had to set aside my cravings for the simple reason that you couldn’t source green papaya in Cape Town…that is, until now! Having spotted a gap in the market, the New Asian Spice Supermarket in Sea Point has thankfully started stocking them. Supply is often erratic, as there’s only one farm in the whole of South Africa that produces these under-ripened gems, but regardless of sporadic supply at least they are finally available locally. And so, in an instant, an obsession was reborn! 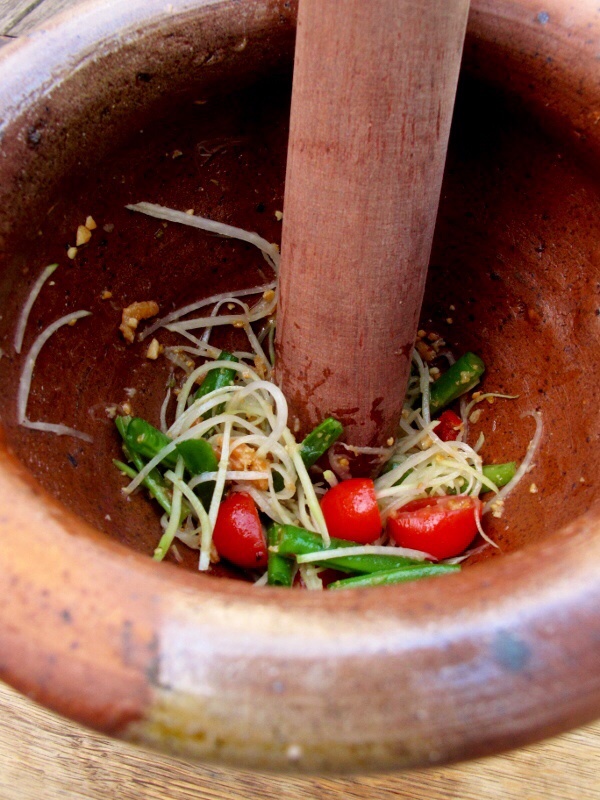 Other than sourcing green papaya, there are two key elements essential to making the salad. The first is the need for a large pestle and mortar, the second is shredding the papaya correctly. The latter can either be done by hand, using a sharp knife to cut into the papaya and then using a vegetable peeler to shred the flesh; or with a mandolin, using a fine shredding attachment. Personally I use a mandolin; while less authentic, it gets the job done in half the time! The epitome of the classic Thai sweet vs. sour dish, Som Tam delivers a tangy, sweet punch with a texture and crunch that is incredibly refreshing. Hot, fragrant and balanced, for many this is Thailand on a plate. Although delicious served with just some plain rice, or as part of a larger Thai banquet, if you want to partner the som tam with something really authentic, try it with Candied Pork and Coconut Rice – spectacular! For more delicious Thai recipes please click here, or if you need tips on stocking your Thai Pantry please click here. Add the peanuts and dried prawns, pound to a coarse paste. Finally, add the green papaya and lightly bruise, all the while turning and tossing the mixture with a spoon held in your other hand.